It’s been a long time coming, but one of our favourite restaurants, Hut & Soul Eatery, have finally come out with a new menu. 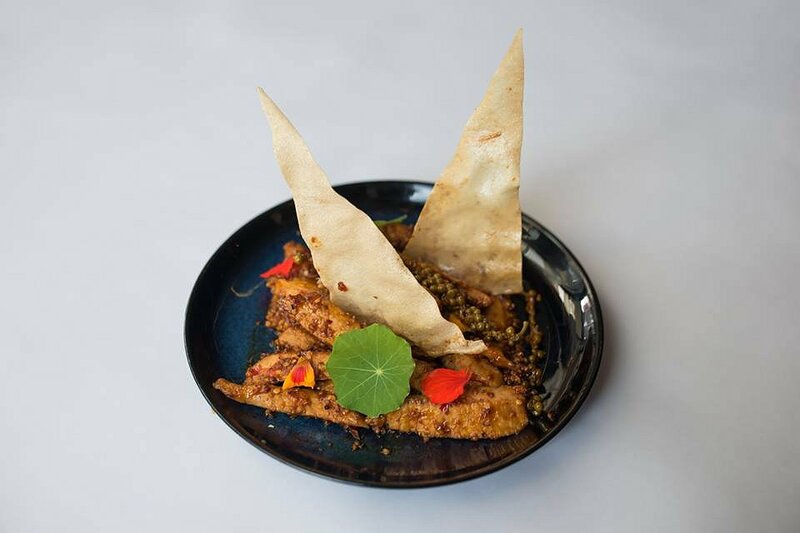 Known for their South East Asian cuisine comprising of Indonesian, Singaporean and Malaysian, the popular restaurant has come up with a new selection of carefully selected dishes. Adelaide Food Central, and other invited guests, were given a special VIP tasting of the new menu. 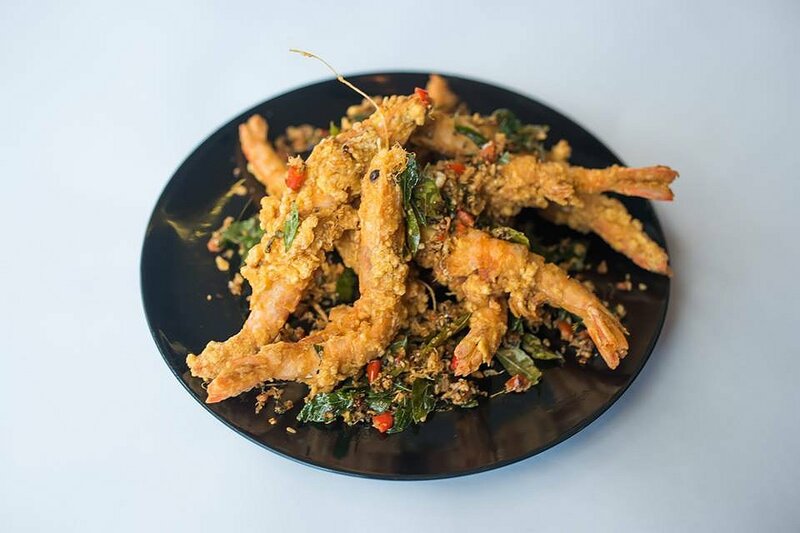 We started off with the Butter Cereal Prawn; SA Spencer Gulf extra large king prawns lightly battered and tossed in butter, cereal, crispy egg floss, curry leaves and chilli. Using cereal inside batter is all the rage at the moment, and with the results achieved, rightfully so. These generously sized king prawns were crunchy on the outside, and moist and succulent inside. Combined with bits of curry leaf and chilli, it was a great way to start the meal. Next was the Garlic Pepper Pork with fresh green peppercorn, chilli, garlic and pepper sauce, and crispy garlic. From the appearance, we initially thought the dish was fish fillets but were surprised to find it was pork. Having said, that the meat was well cooked, and the savoury sauce with a hint of heat, gave the dish plenty of depth. 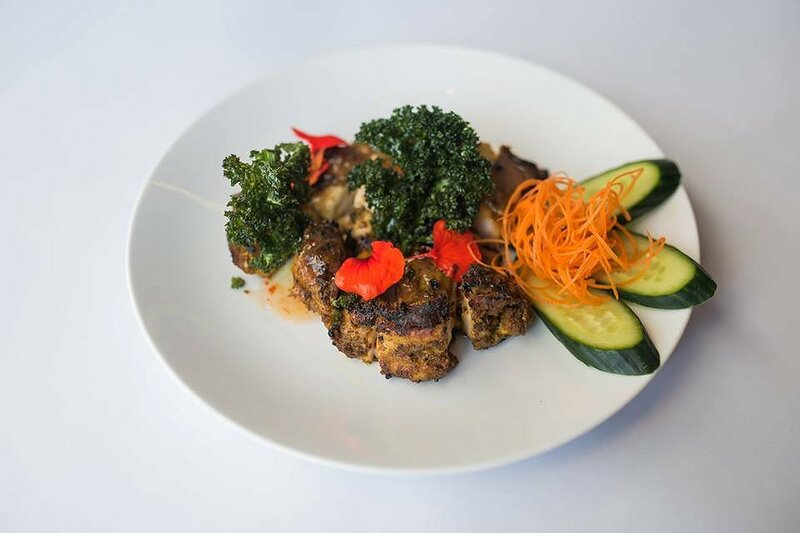 The Ayam Serai is a chargrilled chicken fillet marinated with lemongrass, tumeric, spices, crispy kale, chilli and lime sauce. You really can’t go wrong with chargrilled chicken. This chicken fillet was cooked to perfection; juicy on the inside and lovely chargrilled flavours on the outside. The taste of lemongrass was prominent while the other spices were a bit more subtle. 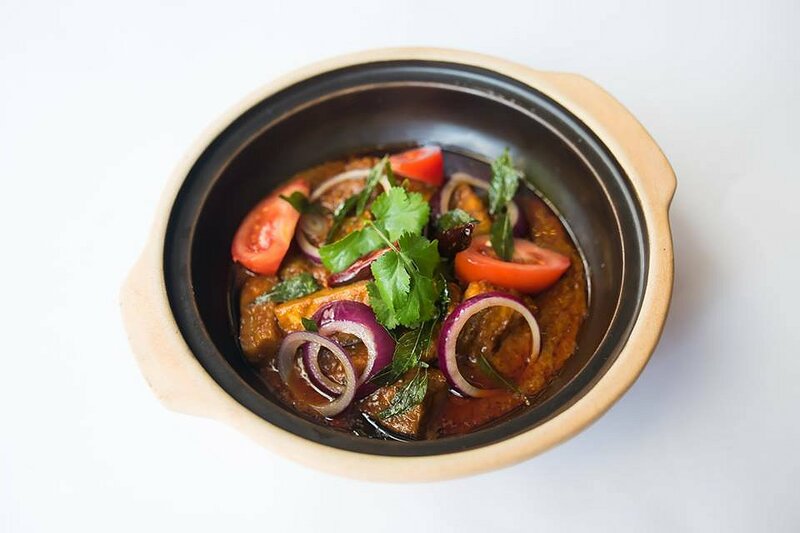 We then had the Mamak Curry Fish; a spice-rich curry with 18 herbs and spices, ginger flower, fresh okra, eggplant, tomato and beans. With more herbs and spices than Kentucky Fried Chicken, this dish was a favourite around the table. The fish was firm but delicate, and the rich curry flavours were well infused into the flesh. Full of fresh and colour vegetables, not only did the dish look good, it tasted great too. 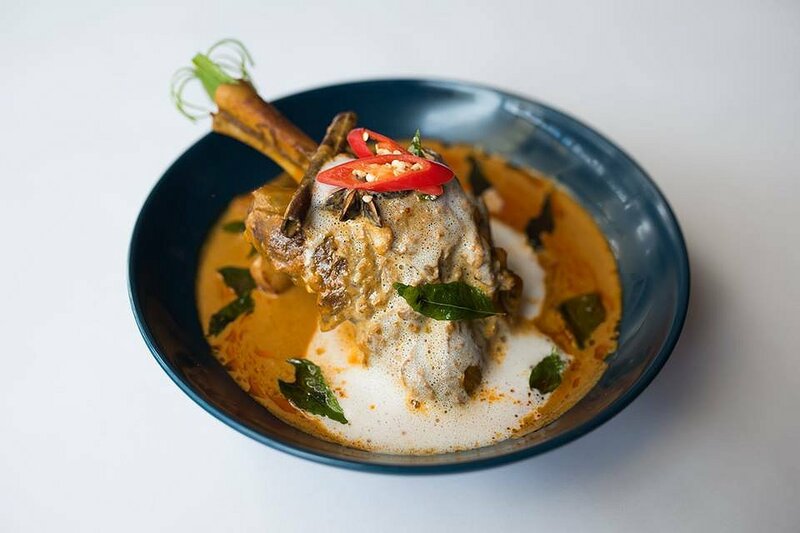 The Guilai Lamb Shank was beautifully presented and was cooked in a rich and spicy aromatic curry sauce that contained coconut milk foam, crispy potato and curry leaf. The lamb shank was slow cooked until the meat was soft and delicate. The curry sauce was full of flavour and mildly spiced, with a lovely thick consistency. 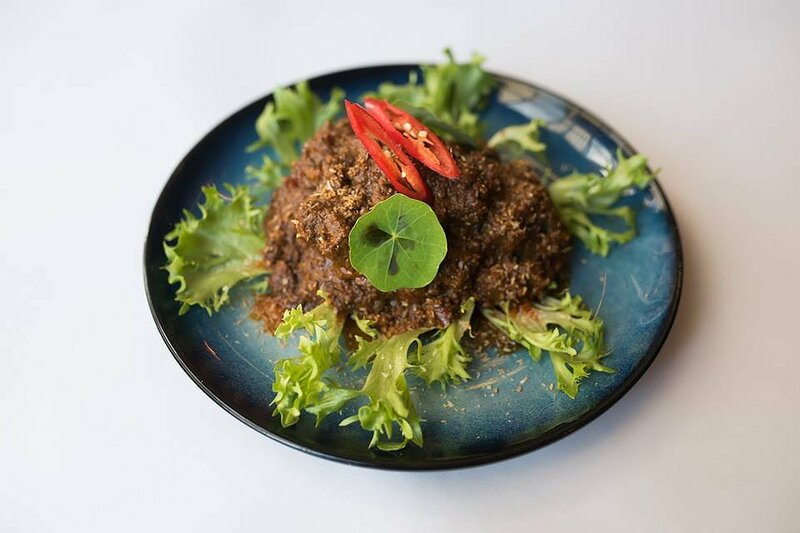 Last but not least, was our favourite dish of the day, the Beef Rendang. The beef was 100D grain-fed yearling slow cooked with a host of spices and golden-hued grated coconut. The beef was tender and succulent, and the meat simply fell apart. The dish was well seasoned; full of flavour with a controlled level of heat. This dish was so good, we had seconds and thirds. Time flies when you’re having fun, and a good 3 hours later, we finally rolled out of there. The food was delicious and we could hardly find anything to fault. The new menu is a winner and will further complement their existing offerings. Adelaide Food Central would like to thank Aloy and all his staff for their kind hospitality. We can’t wait for our next visit. Hut & Soul Eatery is open for lunch Thursday, Friday and Sunday from 12-2:30pm and for dinner every night except Tuesday from 6pm-10pm.